If you have been reading TheGreenAge blog for a while, you will know that we are pretty keen on infrared heating. If you live in a home that doesn’t have access to mains gas, then unfortunately your heating choices are pretty limited, you can either go for a heat pump, storage heaters, electric convection heaters or the infrared heaters. The reason infrared heaters are our preference is that they are affordable (a ground source heat pump for example can cost upwards of £20,000 which makes them too expensive for most) and they are also efficient. The concept of infrared is that instead of heating the air like a traditional radiator (or storage heater), the infrared heaters heat solid objects directly. Once the infrared panels get to temperature, the units emit infrared radiation that travels unimpeded until it hits a solid object i.e. a person or some furniture. This object absorbs the infrared and then warms up. The nice thing about infrared is that you are not wasting energy heating air that can easily escape up chimneys or through draughty windows. You are just heating the objects that require heating. Now considering you are heating surface area instead of volume you do get huge energy savings – but it is easy to say – what are the numbers that back up these huge savings? The savings from infrared all come due to the sizing of the system. Typically an infrared heater just 40% the size of a traditional convection radiator will produce the same level of comfort. So a 1kW convection heater will produce the same level of comfort for the occupant as a 400w infrared heating panel. This is where the savings come from! Typically we recommend using between 50 watts and 100 watts per m2 depending on how well insulated a space is. A better insulated space will be closer to the 50w/m2 while an old uninsulated property will be nearer the 100w/m2. The heating is on for 5 hours per day. We are using a 1kW electric convection heater (and therefore a 0.4kW infrared heater. So in this simple example we are looking at a saving of £60 per year by installing infrared over a standard electric panels heating, but it is worth pointing out that this does not take into account the speed at which the heat is felt using infrared. When an infrared heater is turned on, the panel will heat up and start producing the infrared within just a couple of minutes, it is then that the occupant will feel the warmth. With an electric convection heater, the heater needs to get warm and then this needs to heat the air – it is only then, once the air gets up to temperature, that the occupant will feel the heat. Bearing this in mind, the savings from the infrared heaters stated in the table are actually underestimated. With gas costing just 3.5p/kWh, it is pretty clear to see that the cost of heating a home with gas is considerably cheaper than heating a home with electricity, but there is one important point to consider. When using any form of electric heating, you can heat specific rooms as required, simply by turning on the electric heating units in those rooms. When using a gas central heating system it is much harder, even through the use of thermostatic radiator valves. The reason is that the boiler still needs to fire even if it only needs to provide enough hot water to heat one radiator. So while gas central heating is a great way to heat your home, the fact that you can zone your heating with electrical heating so easily (i.e. just heat rooms as and when required), the case for opting for gas over electric isn’t completely black and white. So in conclusion, if you are going for electric heating and don’t have funds readily available to go for a heat pump, we would really recommend infrared heating as a means of heating your home or business. The running costs of infrared heating versus electric convection heating illustrate there are large savings to be had by making the swap to infrared. The case for infrared over and above a gas central heating system is less compelling, but still the ability to only heat rooms as required and the low install and maintenance costs mean that infrared should not be discounted. Alternatively, if you would like us to find you a local installer to help install infrared heating in your home, just fill in the form below and we will be in touch shortly! 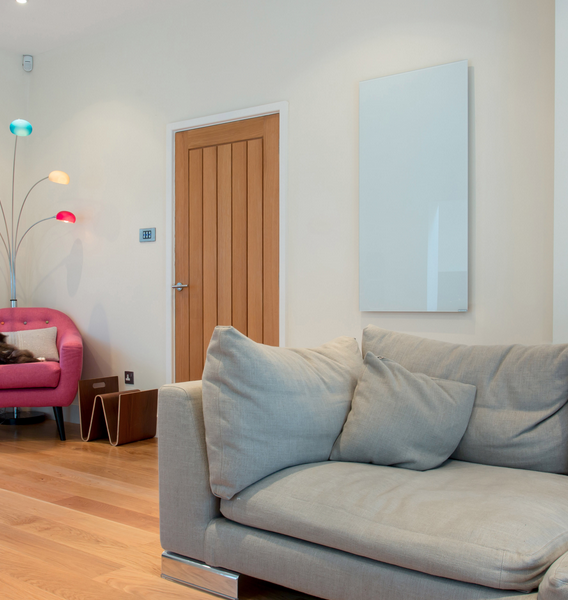 Are you thinking about installing infrared heating in your home? We have scoured the country for the best tradespeople, so that we can make sure we only recommend those we really trust. If you would like us to find you a local installer to help install infrared heating in your home, just fill in the form below and we will be in touch shortly! Interested in finding out more about infrared heating? My company has a night time cleaning crew that cleans buses at night. During the winter, the washbay that they work in gets pretty cold, as it is not heated, and the garage door is quite large and remains open to pull buses in and out all night. I am planning to install some infrared heaters high along the interior of the wash bay to take the chill off of the cleaners as they work through the night. My question is: in this type of application would it be cheaper to operate an electric or a propane infrared heating solution for this situation? I can send you a testimonial from a big warehouse that wanted to heat a specific area of the warehouse only, and not the rest, so they put in our FAR-IR heaters. They were over the moon. What is the Cheapest Electric Heater to Run? How Much Does it Cost to Install Central Heating?